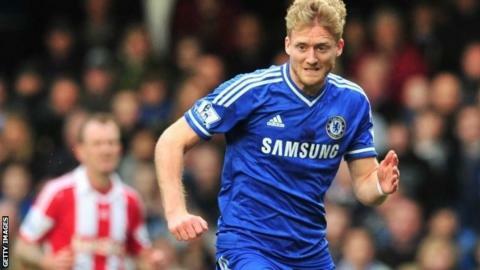 Chelsea forward Andre Schurrle says critics of his side's defensive approach in Sunday's win over Liverpool are just "jealous" of their success. Manager Jose Mourinho was accused of "parking the bus" by Liverpool counterpart Brendan Rodgers in the 2-0 win at Anfield. The victory saw Chelsea move to within two points of Premier League leaders Liverpool with two to play. "Winning is what matters. It's the most important thing," Schurrle, 23, said. "If people look at us and say 'Chelsea can't play', even when we win, it's just because they're jealous." Chelsea took a similarly defensive approach in the first leg of their Champions League semi-final away at Atletico Madrid last week. But Schurrle, who joined the London club from Bayer Leverkusen last year, added: "You can play perfect football, have lots of one-touch stuff, and you lose. "But that's not what you want - you want to win. There's no point in playing well and losing. "If our plan is to win playing this way, and we win, then it is perfect." Chelsea's final two league matches are against Norwich and Cardiff, who are both fighting relegation. The Blues play Atletico in the second leg of the Champions League on Wednesday at Stamford Bridge.